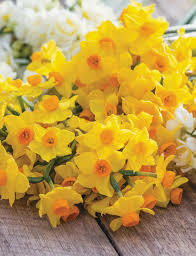 Scented daffodils from the Scilly Isles are arriving in florists. They bring a lovely splash of colour and a room filling scent at this cold, dull time of year. They also make surprise Christmas gifts and Thank You presents. Check out your local florist and specialist Cornish & Isle of Scilly flower growers online.